Chris Bodell cleaning cab panelling RRRG member Chris Bodell cleaning up some driver's desk paneling from 50030 No2 end cab prior to repainting. 15th August 2010. RRRG member Chris Bodell cleaning up some driver's desk paneling from 50030 No2 end cab prior to repainting. 15th August 2010. Chris Bodell doing a bit of spraying RRRG member Chris Bodell is seen spray priming some of the paneling from 50030 driver's desk No2 end. 15th August 2010. 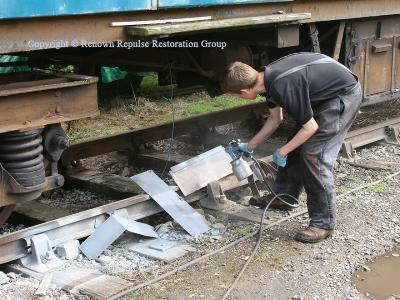 RRRG member Chris Bodell is seen spray priming some of the paneling from 50030 driver's desk No2 end. 15th August 2010. Painted desk frame 50030 no2 end Some of the driver's desk framing in No2 cab has been painted up to protect it until serious work begins on refurbishing the controls, etc at this end. 15th August 2010. 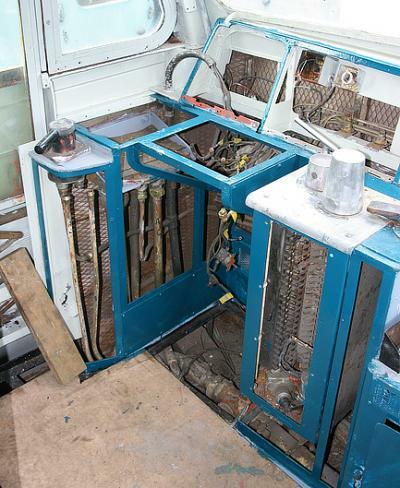 Some of the driver's desk framing in No2 cab has been painted up to protect it until serious work begins on refurbishing the controls, etc at this end. 15th August 2010. Cab rear bulkhead early reinstatement work A start has been made on refitting some of the missing air pipes on the rear bulkhead in No2 end cab. 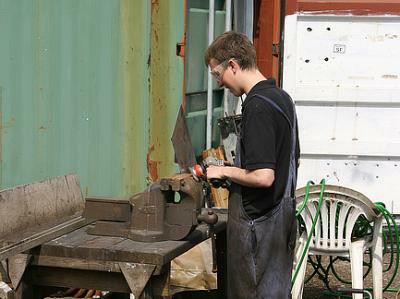 The fittings have simply been laid in at this stage, as further pipework needs replacing before it is soldered up. 15th August 2010. The other big news this month was that RRRG concluded a deal seeing us acquire a useful stock of Class 50 electronics including several required for Renown. The deal also included a set of 50 injectors and main generator brushgear making the power unit destined for 50029 complete. 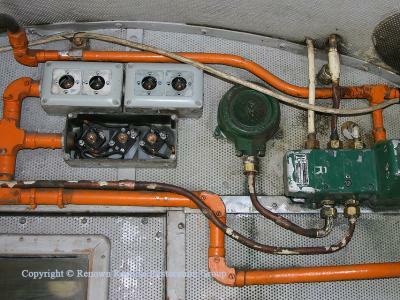 A start has been made on refitting some of the missing air pipes on the rear bulkhead in No2 end cab. The fittings have simply been laid in at this stage, as further pipework needs replacing before it is soldered up. 15th August 2010. The other big news this month was that RRRG concluded a deal seeing us acquire a useful stock of Class 50 electronics including several required for Renown. The deal also included a set of 50 injectors and main generator brushgear making the power unit destined for 50029 complete.